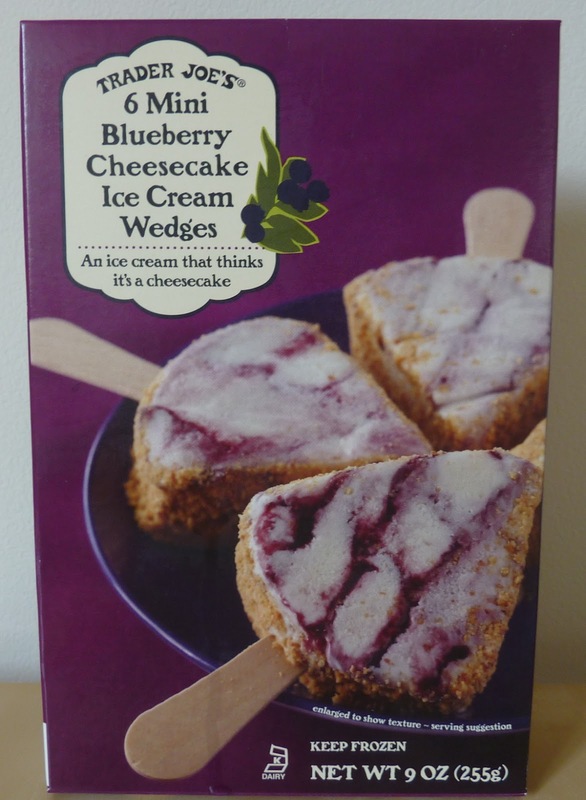 The packaging for this product claims that it's "an ice cream that thinks it's a cheesecake." Now where would ice cream get a silly idea like that? Maybe because you put the word "cheesecake" in the title of this product even before the words "ice cream," Trader Joe. I think you're largely to blame for this poor dessert's identity crisis. Is it a fruit? Is it ice cream? Is it cheesecake? I think it may be all of the above. All at once. It seems paradoxical, but just in the same way that I am a son, a husband, and a friend all at the same time, this dessert may be multiple things at once. In both cases, it's kind of a beautiful mystery. Of all the things that this product is, if there were one that I think it should try to be a little more, it would be blueberry. There are a few graceful swaths of a blueberry gel swimming through the frozen cheesecake, and right in the center of the dessert, there's a larger cache of sweet blueberry goodness, with perhaps a hint of actual blueberry. But Sonia and I both agree that the blueberry-ish center of the ice cream is the best part of the whole thing. We want more blueberry. It already has a fair amount of it. But we want more. We're both only children and we're used to getting our way. It's creamy, it does taste like cheesecake, complete with a graham cracker crust, and it's frozen, with plenty of ice cream-ish properties, too. The only thing we weren't pleased with was the decision to place this product on a stick. In some cases, like this delicious snack, sticks are great. And there are plenty of successful frozen desserts on sticks like this one. But for some reason, both Sonia and I thought the sticks in these particular treats made the cheesecake taste just a bit like wood. Now, we may be nitpicking, but we both think these would have been better just served on a plate with a fork, a la traditional ice cream cake. They are a bit crumbly, so you might need a plate or a bowl to catch the mess anyway. Considering how indulgent they taste, 100 calories per snack isn't that bad. Though they are quite small. I could probably have eaten the entire box of six in one sitting, though my sweet Sonia may have scolded me in that sassy Latin way that I love so much for doing so. Because of the wooden taste, Sonia docked a few points, though overall, she agrees that these wedges are a win. 3.5 stars from Sonia. I think she's blowing the wooden thing a bit out of proportion. These sweet treats are unique and delicious, and I can't go lower than 4.5 stars. Yes indeed. Your local TJs should carry them at some point in the near future. I totally agree - I just polished off a box of these and loved them, but didn't understand why they needed to be wedges on a stick. The stick made them awkward to eat in the way I wanted (which was to save the best, most blueberry part until the end). Super tasty product, but delivery fail. Had them yesterday...just have to say that they are TINY...I thought they'd be about twice the size they were. The stick didn't bother me at all. Blueberry was enough for me, anymore and it would be TOO sweet for me.